Dad’s been having an affair for 50 years now. His mistress is not blonde, brunette, or redhead and certainly hasn’t a well-rounded figure. The neighbors all know — and Mom even allows her to stay in the house with them. 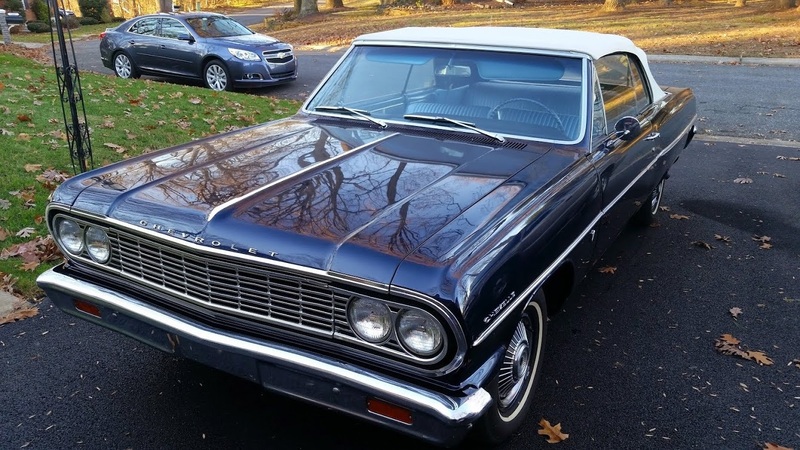 My Dad has been keeping company with his 1964 Chevelle Malibu convertible since she left the showroom floor of Diver Chevrolet in Wilmington, Del. Dad looked at a lot of cars. I know — I was with him. For me, the candidates were endless: a red Impala with chrome to spare, a Buick Electra with power everything, and (the one I fell in love with) a Corvette Stingray. But the Chevelle called his name, which he heard over the noise of three young kids. She was Daytona blue outside and light blue on the inside, with a white top. As with any lady, the price was high: $3,193.55. Notable options included whitewall tires, a radio with antenna, tinted windshield ($19.95), padded dash, and full wheel covers ($18.30). There was also a “comfort and convenience group” for $30.15. Dad doesn’t remember what came with that option. With a $700 trade-in, the loan was $79.99 a month for 36 months. Being the good safety-oriented DuPont employee, Dad took the extra step of adding three seat belts to the back seat. For $16, they had the added bonus of keeping the three of us kids separated during long drives. He was less generous with the other options: no power steering, brakes, or top. Heat, although included, usually lost the battle to the cold drafts coming from behind us in the back seat. Was she giving us kids the cold shoulder? 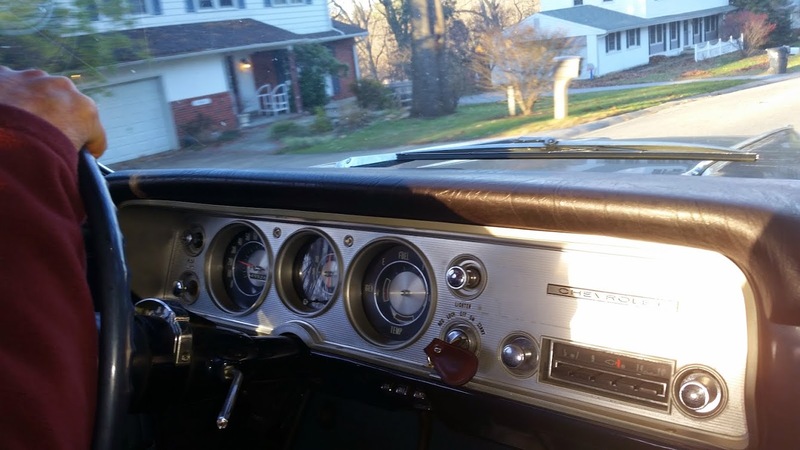 As the only car in the household, the Chevelle performed many mundane tasks, like making grocery runs for my mom or serving as the commuter vehicle when it was Dad’s turn to drive in the carpool (all of his riders less than enthused with the lack of rear doors and space in the back). But most importantly, she was the way to get to the shore on vacation. Although not considered a full-sized car, she took the five of us, along with a week’s worth of clothes and food fitting easily in the trunk, on our way to sand and sunburn. Being at the shore was where this car belonged, and she put up with the mundane in exchange for a week of glamour. In 1969, Dad moved up in the world and bought an Olds Delta 88 and kept the Chevelle as a second car. Dad was not ready to part with her yet, but what was to come would not be considered the good life for this lady. Within years, the car would survive the best that three new teenage drivers could dish out. Despite the limitations of a 283 V-8 hitched to a two-speed Powerglide transmission, attempts were made to burn rubber, power slide through turns, and see how fast she could go before the transmission shifted (50 mph, by the way). We gave our best and she survived it all. After many years, Dad’s blue Malibu came back as the beauty we saw on the showroom floor — if not quite the perfect lady as I remembered her. Some pieces are missing and others aren’t right, but she looks good at fifty. We still don’t remember what “comfort and convenience” was gained when purchased as a group back in 1964. I visit on occasion and I’m reminded of first dates, cruising, and high school silliness. Time has worn on Dad more than on the Chevelle. Two knee replacements make it tough to stop a car with no power brakes. Piloting a vehicle with no power steering is a challenge regardless of the driver’s age. My younger brother Mark has taken over the care now that dad is 85. But after 50 years, the affair continues, even if it’s only for an occasional trip down memory lane.